With a new restaurant practically opening every day in London, it’s hard to keep up. Naturally we expect amazing food, creative chefs, excellent service and not too much bank balance damage, but let’s be honest, it’s rare that a restaurant ticks all those boxes. This burger joint is a little different to Five Guys or Bleecker Street. A butcher/abattoir/factory styling (rubber floor, stainless steel bar, butchers’ curtains et al. ), and in contrast the walls are covered in graffiti. 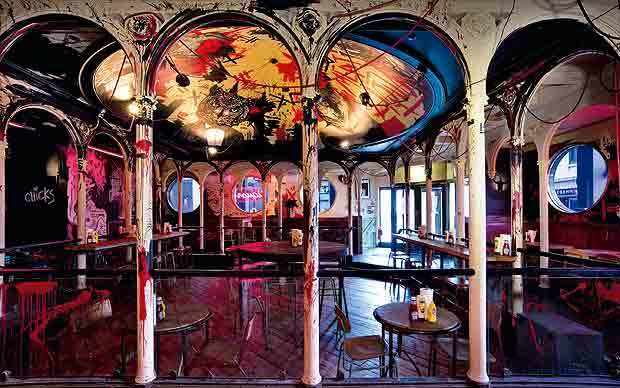 I Love Dust was commissioned to work across all the MEATliquor restaurants. Let loose in each venue for a week, the artists cover all visible surfaces, including the ceiling, with illustrations, script and paint splatter. Heading up north to Leeds, Michelin star chef Michael O’Hare is mixing art with food. Each dish is a piece of art in itself, both in taste and presentation. The restaurant has recently gone through a refurbishment, but you can expect the same sort of design, style and Michael O’Hare pizzazz. Previously the walls were adorned with graffiti and splashes of paint by O’Hare’s friend and artist Schoph. And guests were surrounded by Grasshoppa lighting and Masculo chairs. This lofty conversion is just one of three restaurants O’Hare has opened up north and all are filled with bespoke styling, designs and art. How could we not include Tramshed? The menu is short and sweet offering steak or chicken, and the art work across the space mirrors this. Taking pride of place is Damien Hirst’s formaldehyde tank with cow and a chicken atop its back, which is placed seemingly precariously above diners. The second piece is also by Damien Hirst, a painting of the popular 90s Cartoon Network series Cow and Chicken. The restaurant next to the Serpentine Galleries is a little bit of a cheat for this list. It’s not so much the art on the walls, but the building itself as a piece of art. 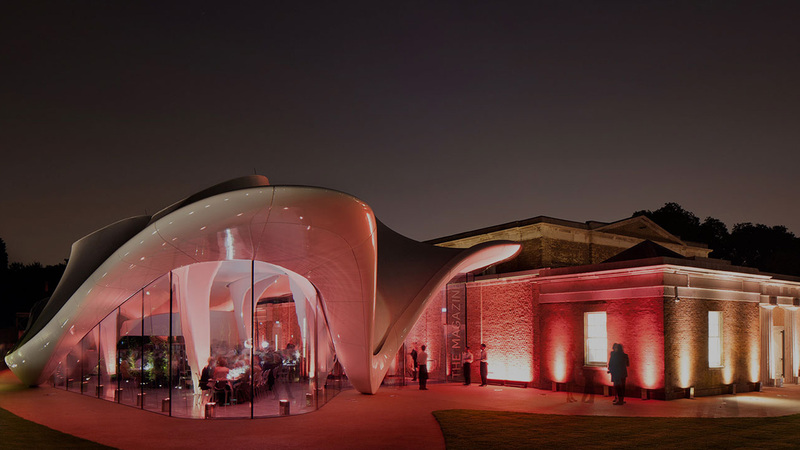 Designed by Zaha Hadid, this curved futuristic structure feels more like a space ship than a restaurant. The smooth flowing roof almost resembles a solid marquee canvas and is intercepted with columns that flood the space with light. Back to Hix and Hirst. 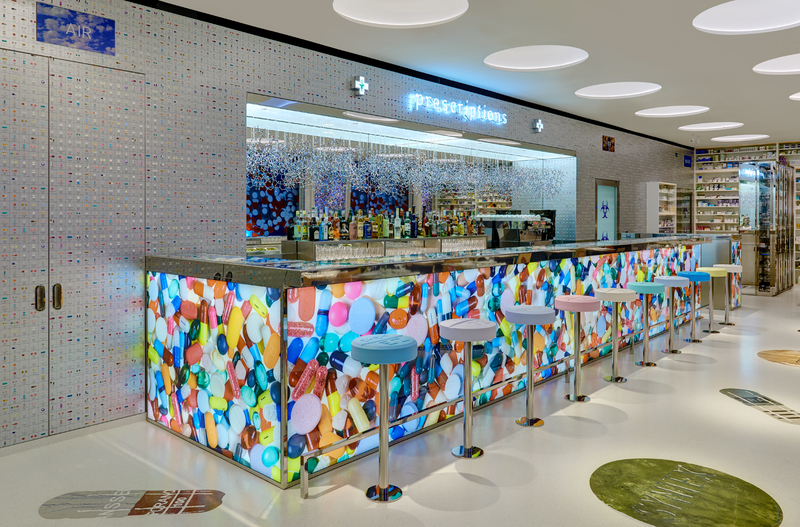 Situated in Newport Street Gallery, this arty add-on is filled with Hirst’s medicine cabinets and butterfly kaleidoscopes. Far from the industrial feel of Tramshed, it’s bright and colourful with a lot to look at. Padded pills make bar stall cushions, molecular models hang from the mirrored ‘prescription’ bar and conical flasks are converted into lamps. 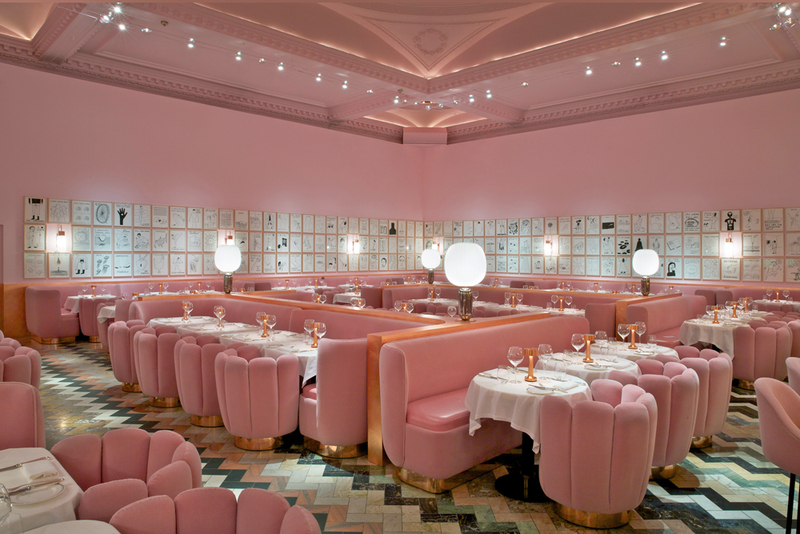 Really the whole of Sketch is like one mad art gallery; the egg toilets, the mural in the Glade bar, the floor-to-ceiling mirrors, but it’s the famous pink dining room (filled with pink velvet seaters, tables and floor) we’re focusing on this time. It is also famous for the 239 pieces of art by David Shrigley which line the pink walls. Shrigley’s work can also be found on the tables: the salt and pepper pots (‘dust’ and ‘dirt’), plates and tea cups. Have you visited any of these restaurants? Or have we missed any of your favourite art-spots? Let us know what you’re up to on Twitter! If you like this blog, you’ll love our newsletter, sign up here.